RAHWAY, N.J., October 27, 2011 â€“ A new era of wireless entertainment has arrived asÂ iHome, a leading supplier of innovative iPad, iPhone and iPod speaker solutions, today released theÂ iW1 Wireless Rechargeable Speaker System with AirPlayÂ®.Â The iW1 is a portable speaker system that is easily set-up via the free iHome Connect app to stream crystal clear audio within Wi-Fi network range from your iTunes library or iPad, iPhone and iPod Touch. Powered by a rechargeable lithium-ion battery and controllable by the sleek,Â capacitive touch panel, iOS device or included remote control, theÂ iW1Â enables a trulyÂ wireless listeningÂ experience that employs Bongiovi Acoustics Digital Power Station (DPS) technology and four (4) active speakers for premium audio performance in a compact design. 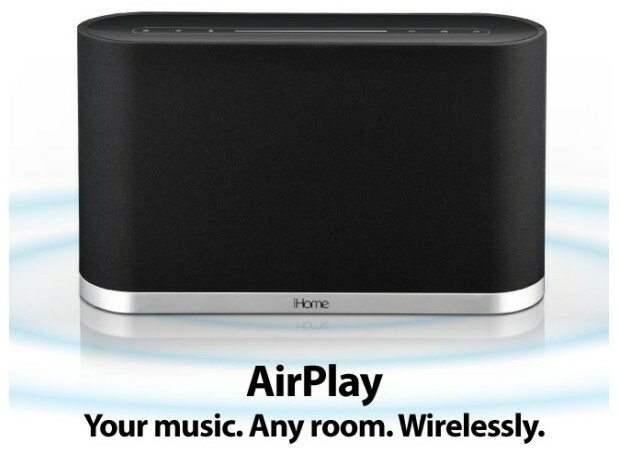 Â UsingÂ AirPlay, owners can wirelessly stream music over Wi-Fi to the unit from iTunes on their Mac, PC, iPhone, iPad or iPod touch and enjoy music in any room of the house. Â AirPlay requires iTunes 10.1 or later and iPhone, iPad, or iPod touch with iOS 4.2 or later. The iW1 is currently available for purchase at Apple Store, Best Buy and Crutchfield for $299.Â For detailed product information, please visitÂ http://www.ihomeaudio.com/iW1BC/. iHome was established in 2005 as a division of SDI Technologies to develop and market iPod electronics.Â The first iHome product introduced, the iPod Clock Radio, was an exceptional success that became the top-selling iPod accessory for the year, and firmly established iHome as the premier brand in the iPod electronics market.Â Since then,Â iHome continues to be the #1 brand in iPod/iPhone audio docking systemsÂ according to NPD data and has been at the forefront of design with a growing lineup of award-winning iPod-compatible audio products that includes alarm clocks, clock radios, portable and home speaker systems, and headphones., as well as new licensed lines of computer accessories and New Balance sport/fitness headphones. iHome supports its franchise with national print, broadcast and online advertising campaigns, and the companyâ€™s products can be found worldwide in 60 countries or on the web atÂ www.ihomeaudio.com, onFacebookÂ (facebook.com/iHome), or followÂ @iHomeÂ on Twitter .